I thought you might like to see the books and ARCs I picked up at BEA. I spent most of my time at the expo talking with publicists and marketing and publicity people, and I did not get tickets for author signings. Nevertheless, I was able to pick up a few show giveaways. 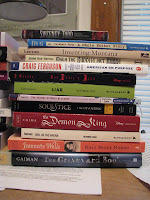 Fortunately, the majority of these books won't be out until the fall, so I have time to get to them for review. If I decide a book isn't for me, I'll likely hold a giveaway. Sometimes I was just handed a book and didn't have time to look it over to see if it was something I really wanted to read. I tried to be selective, and I tried not to add too much to my TBR pile. After all, every book displayed at the show will be available for sale in just a few months. Oh, you got Stitches! I really want to read that one. As much as people say that there were fewer ARCs there were still a whole lot. I have been looking at all the lists and pictures of books and everyone got something different. Wow, what fun to have all those new titles to pick from! I hope you have some good stuff in those big piles! Holy smokes that is quite the stash you walked away with. A whole lot of YA to boot. Color me green with envy! That is an impressive number of books! I hope there are some gems in there! I somehow didn't see half of the ones that you obtained! Lady Macbeth's Daughter sounds interesting to me. It's so interesting to see what everyone picked up at BEA and I like to see that there was quite a variety. I'll be interested in hearing your thoughts on Jeannette Wall's new book. This is wonderful. You got a lot of books. I look forward to your thoughts. And I am thinking of ways to rob you! That's just great-what a load of books. Can I enter your contest now?! ha. I want to read the Kidder book and the Ferguson memoir and I'm jealous of the signed Gaiman hardcover! I ended up with more books that I really wanted because my hubby was wandering around picking them up while I was chatting with publicists. But it was a bit like Christmas when I unpacked them, even though I packed them myself! I know there were less ARCS around than in previous years, but there were still plenty. I only have four or five from your list. Nicole's right, everyone got a different mix. Wow. Lots of books and authors I haven't heard of. Look forward to your reviews. Nothing better than a stack of new books! Lots of titles that look interesting. Happy Reading. Looks like a successful trip to me. I am really looking forward to Jeannette Walls book as I really enjoyed her first one. It looks like you will be busy this summer reading and writing! Tell me you didn't carry these all the way home! I really can't wait for your reviews, a lot of these books have been on my list since I first found out about them. It looks like you picked some winners! It is amazing to me just how many books I missed. :) Enjoy these reads...I'm excited about quite a few of them! I think the only books we got in common are the 3 from the breakfast and The Graveyard Books. I love looking at the stack I got. So lovely! And you got a signed copy of The Graveyard book! You've got a lot of great reading ahead of you. The YA books sound very intriguing. Extremely jealous...The Graveyard Book by Neil Gaiman (finished hardcover, signed)...I have read this and it is great! wow! you have so many YA books in the piles--i'm green with envy. i'm always on the prowl for new trade books for the my students and can't wait to see what you have to say about the books you picked up! i'm going to BEA next year, no doubt about it. Can you believe we only have two in common? Super excited about both though! Our overlapping books are the 3 from the Author's Breakfast and STITCHES - I'm so excited about reading another graphic novel. Yes, I tried to be selective, too. I did stand in line for a few signings of authors I admire. I'll look forward to your reviews - I haven't read any Gaiman. I am so jealous of your autographed book by Neil Gaiman. You have no idea how long the line was at the National Book Festival in September. He was signed up to give autographs for two hours initially, but he extended it for another hour or two (can't quite remember anymore) because there were so many fans waiting on him. He's a great guy. What a fantastic pile you have there. Some of the titles I've heard of but most I haven't. I look forward to reading about them. I'm so jealous. I want the Jeannette Walls book and Liar. Hope they are releasing soon. But honestly, what a wonderful stack. I'm glad you had a great time. Seriously, what a great hail. Happy reading! Well, you have your summer reading all set and ready to go! What a lovely haul! wow and I thought I got a ton of books from BEA. Those are two impressive stacks. 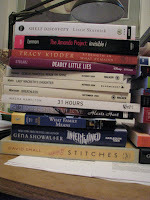 My stack from BEA is quite impressive, too. And, it seems I don't have any of the ones you got. That's amazing! !